Wow! This was quite possibly the best book I read in 2015. I loved it that much. First of all, the book itself is beautiful. When I saw it for the first time I knew my bookshelf was just aching to display it. The pages are stained and it is so dark and gorgeous. The book is written in multiple points of view which was essential in helping us get to know each of the characters. They were all incredibly complex and you learn their histories in bits and pieces as the story progresses. They are all thieves and misfits, working together to infiltrate a massively guarded prison to free a scientist for an outrageous sum of money. Leigh herself described it as Oceans 11 meets Game of Thrones. The only issue I had with this book was imagining the characters as the ages they are portrayed to be because they are intelligent, resourceful, wise well beyond their years and there is so much depth to them for being so young. Picturing them as teenagers proved a tad difficult. 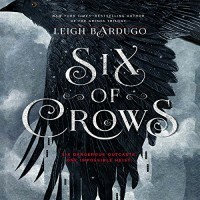 The thing that really helped me out was Leigh Bardugo's pinterest page. I wish more authors would take to pinterest and pin their inspirations for character's looks, dress, mannerisms, style, faces. Just take a peek and see what I mean. Brilliant! Kaz was a truly fascinating character. He's flawed and scarred and the more you learn about him the more fascinating he becomes. Why does he wear those gloves and walk with a cane? How does he always stay one step ahead of everyone? I loved discovering all the details. I adore Inej. She is the Wraith who can sneak up on almost anyone and disappear without a trace. She gathers information and secrets. She's deadly with her throwing knives and can scale a wall with ease. Jesper the sharpshooter always had the best lines and brought plenty of humor to the group and Wylan seems like a lost puppy that needs to be adopted. I'm looking forward to watching their characters grow. Nina's love/hate relationship with Matthias was very interesting to watch. Now if you're like me and always manage to butcher character names, fear not! Leigh was kind enough to pronounce them for us here. There was so much danger, intrigue, danger, betrayal, danger, narrow escapes, daring rescues, more danger. I recommend a hot cup of chamomile tea to calm your nerves as you near the end of this book because that ending, wow! The romance in this book was done wonderfully. It didn't take center stage, it was messy and flawed and so beautiful. I can't say enough about how enjoyable this book is.